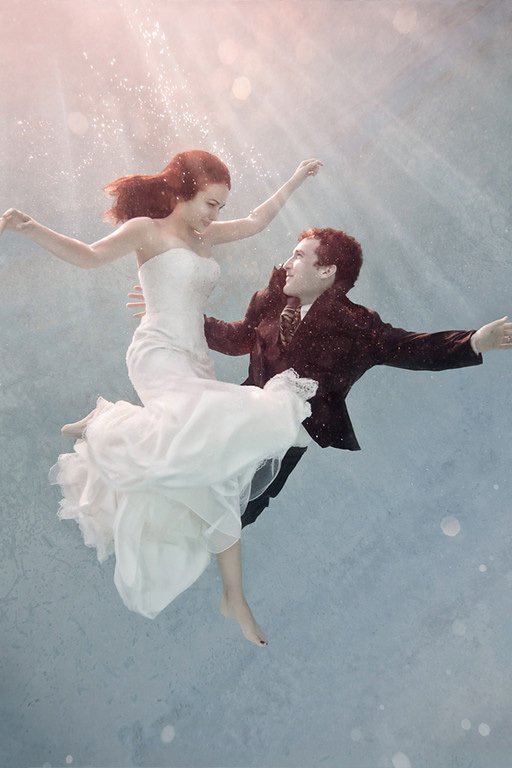 This is the team that worked together to create the underwater wedding couple portrait series – the wedding couple, Kitfox and two assistants. Kitfox’s assistants are strong swimmers and trained in CPR. 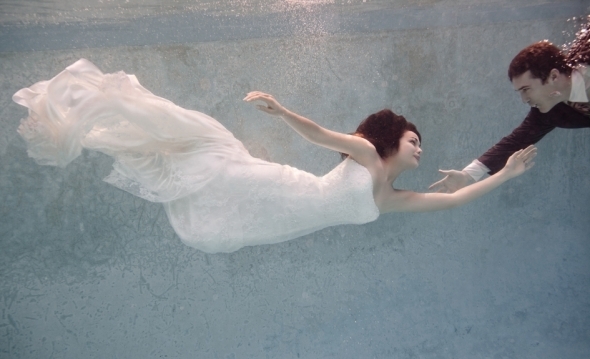 In addition to positioning and holding the LitePanels during the shoot, they also assisted the bride and groom in the water and would have been immediately available in the event of an emergency (wedding dresses hold a lot of water and can become very cumbersome for the bride in the pool). Kitfox uses an Ikelite underwater camera housing unit with an 8-inch domed port. The corrected port helps to minimize the magnification and optical distortion that can occur with a flat port when used underwater. 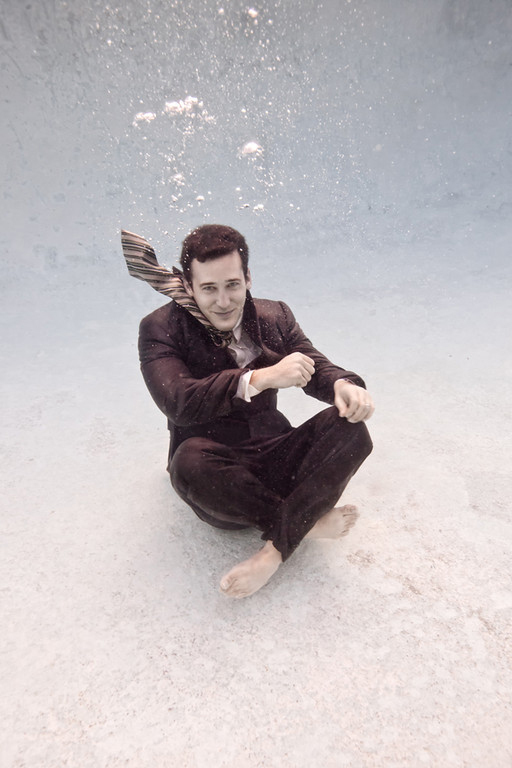 This pool was chosen for this session for a few reasons. The water was not completely clear, which was good, as it allowed for a diffused, natural look. Also, the wall of the pool had a mottled stain, which didn’t look like that of a traditional swimming pool. Most importantly, though, the pool had warm water and a shallow end with easy access. A warm pool is essential to work in, since cold water can restrict breathing and make a session very uncomfortable for the subjects. The session started in the shallow end of the pool. Kitfox first showed his assistants how to use the Photoflex 39×72″ LitePanel and MultiDisc to add reflected natural light onto the subjects. In the image below, notice how the LitePanel is vertical and half sub-merged for the warm-up series. For the later series in the deep part of the pool, the reflectors would be completely submerged. The light was mostly top-lit and the goal was to pop some clean natural light into the front of the bride and groom. This would keep the photos from looking dimensionless and dull. The beauty of using the LitePanels is that they don’t absorb water and they are quick to dry out after a session has ended. 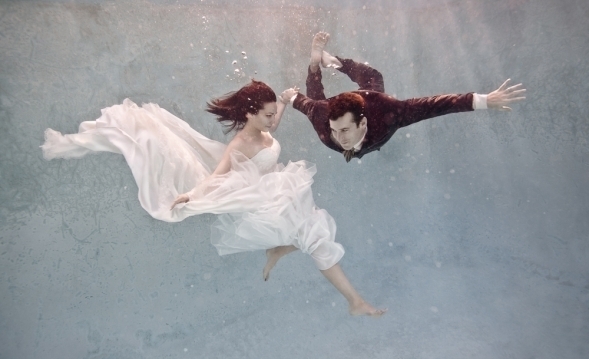 Here’s a top view of a practice run with Kitfox and the subjects underwater. Here’s the same setup from an underwater vantage point. Notice how the LitePanel is partially submerged to reflect light onto the bride and groom. 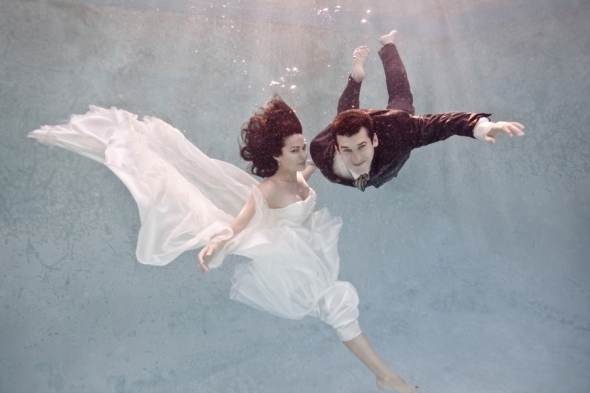 This practice session in the shallow end of the pool was done to help get the bride and groom comfortable in the water and test their abilities to hold their breath underwater. 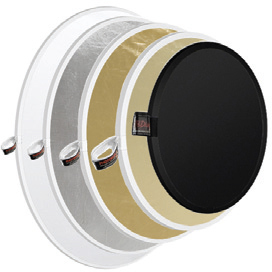 Here, the 42″ MultDisc was used as the fill light. Once everyone had adjusted to the water, the session was moved to the deeper end of the pool. The setup consisted of the 39×72 LitePanel with silver fabric attached and the 42″ MultiDisc with the silver fabric reflecting. The LitePanel provided the majority of the fill light, while the MultiDisc added a little kicker. Note that both reflectors were completely submerged for the shots in the deep part of the pool. In addition to bouncing sunlight into the shadows, these reflectors helped to essentially “clean up” the hazy blue cast of the pool water and add a little sparkle to the subjects. To create a moment of contact for the bride and groom, it was important to first have them apart from each other and then have them approach each other slowly. This helped to create the flowing of the clothing as they moved through the water. Here’s another vantage point that shows the LitePanel in relation to the bride and groom. Here’s another view of the setup that shows the MultiDisc being used to reflect light. By the end of the shoot, the crew was tired and waterlogged, but happy as clams. Photographed by Kitfox Valentin. Setup shots and copy by Steve Kurtz.